The translation code is now part of the main game; the newest translation package (at http://spikycaterpillar.com/long_live_t ... ranslation ) has what should be a complete text dump of all the translatable strings in 1.2.19. Any bugs in the translation code that have not been fixed should be re-reported, as should any strings or images that should be translatable and aren't. I don't currently have hooks to change fonts after language switching, but that could be added. * 'subtitution' substituted by 'substitution'. * Severin's vote for Elodie is now properly punctuated. * Bonus/Penalty indicators on mood in skills screen. * Studying... indicator now mentions mood effects. * Mood-related failure now shows up in study fluff. * Several strings that couldn't be translated are now translatable. * 'Afraid +1' changed to '+1 Afraid'. * 'Transporting large amounts of good upriver' now goods instead. * The Terrax bluff option is now 'Threaten to ally with Terrax'. * Now consistently uses Yieldingess in affected bubbles. * +5 Pressure -> +5 Pressured. * Extra line feed before 'Your skill in X is now 50...' dialog now trimmed. reasons other than a cap. * File save name field should be translatable. * Title screen button images now translatable, as is preferences text. * Logs should now be translatable. * Language should be included in tracebacks. skipping seen is now forcibly disabled. * Now uses 'Show Log' instead of 'Save Story' on the ending menus. * On-screen keyboard now translatable. What's a gorgeous. Thank you VERY much! It working almost perfectly. Some phrases, however, seem to be still untranslatable. For example, a Study texts, Achievements, Several profile texts and a phrase that includes "/n" weren't applied translated texts. Okay, study results, strings containing \n, and a few previously-untranslated strings in profiles should be translatable in alpha 1.2.20.1. I've also fixed a crash when displaying logs that were saved to directories containing non-ASCII characters, at least on my own computer - this should be tested on other peoples' systems, though, since what works on my computer might not work on other peoples'. Speaking of which, The game crashed when it attempted to displaying a log in previous versions, but in v1.2.20.1, it works correctly now. 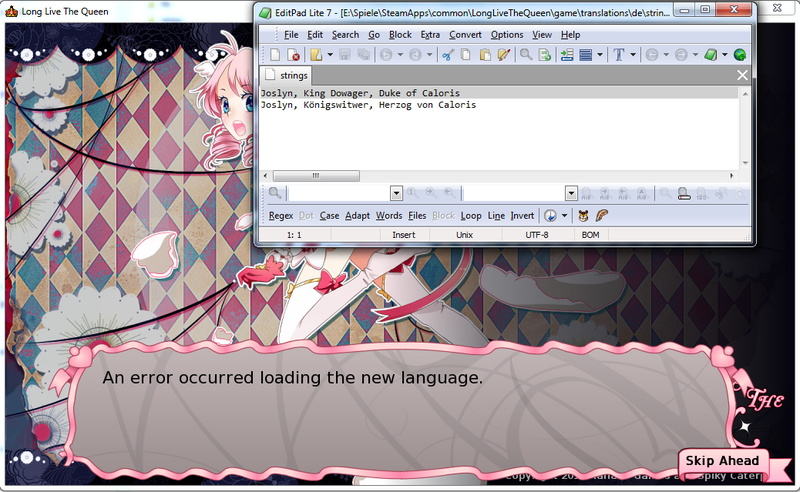 Hm - I tried to start with a German translation, but can't get changes to load into the game. Deleted the existing de folder, renamend sample to de, changed the name in name from Sample to Deutsch. At this point loading the translation works, but no step further. It's not the umlaut, I tried avoiding it by using "oe" instead of "ö", but same error. Any ideas? My version is from Steam. If you upload a zip or tarball of your translation directory somewhere, I can take a look at it. Ohana wrote: If I get permission I can provide template blanks for all of the bitmap buttons with text, but some may take a while to make due to how they are composited. "Current mood: x", "Bonus to: x", "Penalty to: x". You need to pick both a morning and an evening class. You need to pick an evening class. You need to pick a morning class. Now that you've finished studying,\nwhat will you do for the weekend? Regarding new alpha, is there anything that could, theoretically, break translations? Derevo wrote: Regarding new alpha, is there anything that could, theoretically, break translations? which lists all the new lines. Also the lines that you reported weren't translating should now be translatable.